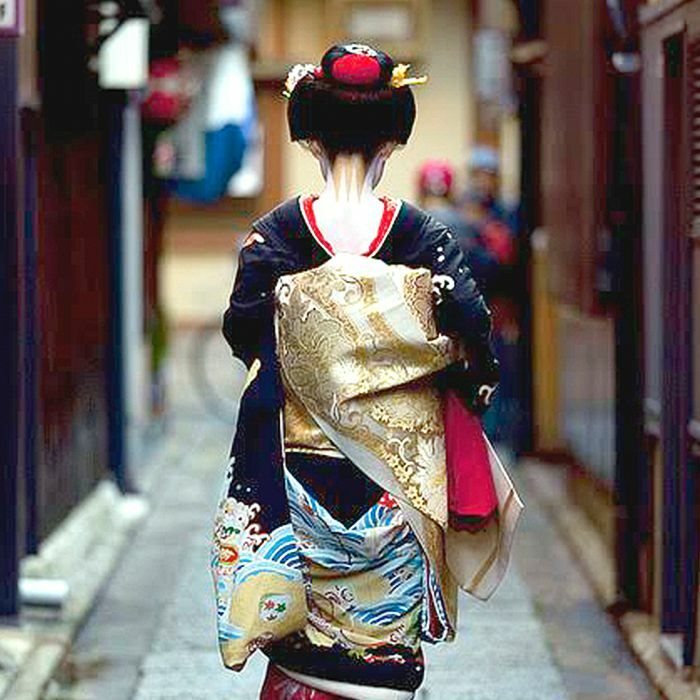 Steeped in tradition and ancient Japanese beauty rituals, the image of the geisha (and by the way, there are still thousands currently practicing in Kyoto, Japan) conjures striking images of their customary stage makeup: bright red lips, opaque white skin, and boldly painted brows and eyes, all of which are accented by their signature chignons (called shimadas) and kimonos. But what about their approach to wellness? Due to our consistent curiosity, we're now fairly well versed in the modern-day geisha's makeup and haircare routines, but we're still somewhat mystified when it comes to their philosophies on wellness. To gain more information on the topic, we reached out to Vicky Tsai, founder of the Japanese-inspired skincare line Tatcha, which she based on the fundamental commandments of geisha beauty secrets. "It feels lately like the stress of modern living has removed us from nature, which inspires us to look to the past for wisdom—whether it's yoga, meditation, or plant-based diets," Tsai explains. "Geisha live in a modern world among us, but they keep alive classical arts and approaches to their beauty, their work, and their lives." And though geisha continue to perfect their practice and perspective, Tsai tells us they remain diligently faithful to the ingredients and regimens of centuries past. Intrigued? Keep reading to discover four effortlessly adoptable wellness tips inspired by the modern-day geisha. "It's as easy as eating local, seasonal fresh foods and getting outside as often as possible. Geisha walk everywhere and enjoy the benefits of physically moving, but more importantly, the benefits of being outside," says Tsai. Interestingly, Tsai shares that the traditional, glow-enhancing ingredients geisha use to keep their skin healthy mirror their day-to-day diet staples. For instance, to keep their skin (and minds) clear, geisha maintain a conventional Japanese diet complete with things like antioxidant-rich green tea, rice, and seaweed, giving new life to the age-old phrase: You are what you eat. Geisha are also extremely active; however, their approach to fitness is vastly different than our Westernized routines: "For geisha, it's all about moderation, balance, and prevention. It's very different from the common Western cycle of binging, dieting, exercising furiously, and then sitting all day," Tsai explains. "In the West, we'll binge and then dramatically overcorrect, which can be damaging to our body, including our skin. We also often fail to consider underlying factors." For instance, when it comes to beauty, geisha believe that our skin is a reflection of our mental, physical, and spiritual health, and geisha will take the time to consider what might be causing a large problem like, say, acne by taking greater things into account like stress, sleep, and diet. "You don't have to sit with a guru for an hour in a candlelit room to enjoy the benefits of meditation," Tsai explains. "A monk in Kyoto taught me about body meditation, which includes eating, breathing, and moving mindfully." But what does that look like exactly? According to Tsai, meditation (which geisha believe to be both grounding and centering) can be as simple as shankankan, a Japanese philosophy known as "the beauty of taking one's time." It's a reminder to slow down and enjoy the small things in life. For instance, try setting aside some time to make one of your favorite meals for dinner and savoring each bite in lieu of staring at your phone. Additionally, try paying attention to your breath. Taking regular, deep breaths can trigger the release of calming hormones in the brain and, in turn, help you to feel far more balanced and centered in your day-to-day life. "The same monk instructed me that if you feel yourself getting tense, try swaying back and forth. I asked him why, and he said it is very hard to be angry and sway at the same time. I tried it, and he's right," Tsai iterates. As Tsai explains to us, regularly practicing acts of gratitude can actually make us happier (and healthier) over time. And just in case you're apprehensive, recent scientific studies are supporting the ancient notion. "In Japan, gift-giving is a core part of the culture, and they express gratitude for every meal before eating. It's a way of life," says Tsai. For instance, you can set aside a bit of time each day (it doesn't have to be a lot) to express gratefulness for the people in your life and for the small joys you encounter in your day-to-day routine. Next up: We tried the nine most popular Japanese beauty secrets on the internet.